After almost 5 years as a student at the Oslo National Academy of the Arts, Eyvind Solli Andreassen gives the audience an insight into the past, development and future, in and after his studies. In the exhibition "I remember something" Andreassen shows works of individual ceramic objects, focusing on shape, volume and size. In the exploration for how much different processing of a material such as clay can change the visual perception of the object - from one form to another. 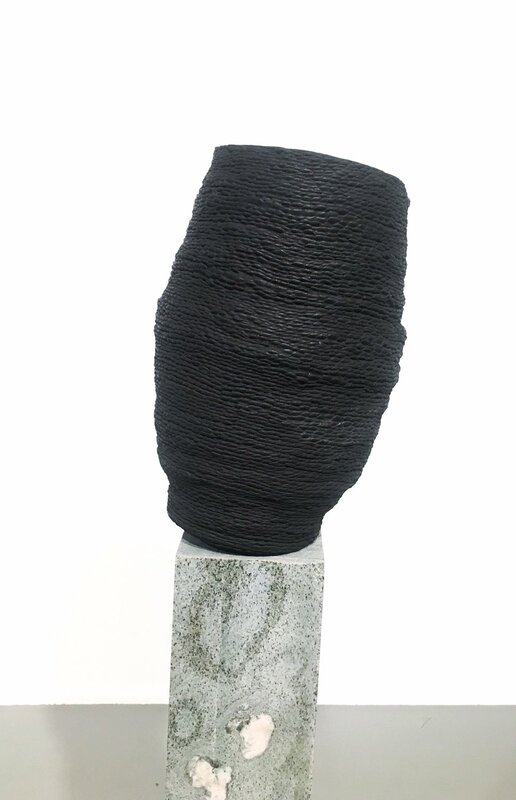 The objects are created by the painstaking hand rolling of clay coils placed on top of each other, and formed into varied, organic forms. The elements are worked together by using only one finger. The repeated fingerprints all over the object left behind after firing stands as a visible conveyance of Andreassen's interaction with the clay. The same traces also reflect the time that has gone into shaping the countless coils and objects through Andreassen's time at KHiO. With a desire to play with gravity, and to play on the uncertain, the objects are created and placed in an almost nervous balance point, where the possibility of them falling into the ground lingers throughout the room. The objects are completely free of glaze and are made of different types of clay, with the thought of highlighting the different properties of the clay. By taking advantage of the natural expression and colour of the clay, Andreassen emphasizes the texture and the tactile of the surface, both inside and outside - where the smooth meets the rough. Eyvind Solli Andreassen (1986) is from Heistad in Porsgrunn. He now lives in Oslo, where he is in the process of establishing himself as an artist. Andreassen is a formerly trained sheet metal worker and welder but is currently in his second and last year as a master's student in medium and material-based art at the Oslo National Academy of Arts, with a main focus on ceramic objects and sculpture.In addition to his studies, Andreassen has during the past year also participated in several exhibitions and fairs both in Norway and abroad such as CHART Art Fair 2018, Copenhagen, NK Annual Exhibition 2018, Fredrikstad, and London Design Fair 2108.